For the past few weeks, I have had the good fortune of testing out some paper products from Majesta's new eco-friendly line called Treesponsible. In the company of some fantastic Canadian mom bloggers, I learned about what makes Majesta products unique, shared our experiences and discussed ideas on what we can do to be more "green." In fact, one of the first things we discussed was the types of things we are currently doing in order to be eco-conscious and help our planet. From the list of the things I'm currently doing (or trying to do) to be eco-friendly, I have created a list of tips and ideas on how we can all be more "green." Look into buying high-efficiency appliances. Do laundry during off-peak hours and use cold water. Fill the dishwasher to the max before washing. Use cups when brushing instead of letting the water run. Consider buying a water purifier instead of bottled water. We just bought a new one by Mavea that has a filter recycling program. Recycle. And teach your kids to do the same. I'm still working on my husband. Encourage your child's school to take part in an eco-school initiative. The school where I work is an eco-school and just yesterday we planted five new trees in front of the school. Use low-wattage, high-output light bulbs. You can even find some that emit "natural" lighting. And remember to turn off the lights when you're not in the room. Stock up on re-usable grocery bags. Donate unwanted clothing and toys to local charities. Use rechargeable batteries and dispose of old ones safely. Do not throw them in with the garbage. Mail out old ink cartridges to be reused. Buy organic, natural and local foods whenever it's feasible for your family. Even though this sounds like a lot, I know there is still more our family can do. But it is great to know that over the past few years a lone, the number of companies that offer eco-friendly products has multiplied exponentially. That always makes it easier for us moms. So yay, Majesta! Now, when I was first asked to try out Majesta's new line of recycled paper products, I had this pre-conceived notion that the toilet paper and facial tissue would feel pretty rough and probably wouldn't do as good of a job as some of the popular brands out there. But I must say, I was pleasantly surprised at the quality of the facial tissue and toilet paper. They felt quite soft and held up very well when I put them to the test. The texture of the paper towel was a bit different, being a bit stiff, but compared with the other brand I used, it was pretty much the same. It felt a bit thin but it did seem to handle the cleanup fairly well. 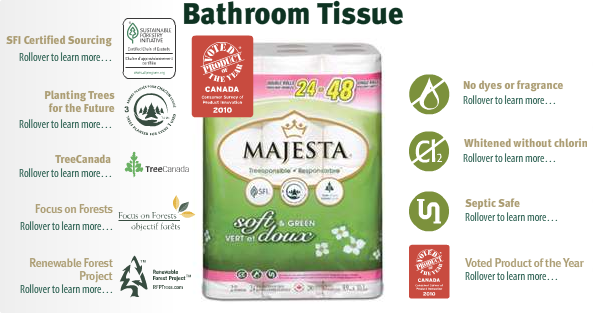 As part of the Majesta moms group, we were asked to try out an experiment to test how easily Majesta toilet paper breaks down in water in comparison to a leading brand. 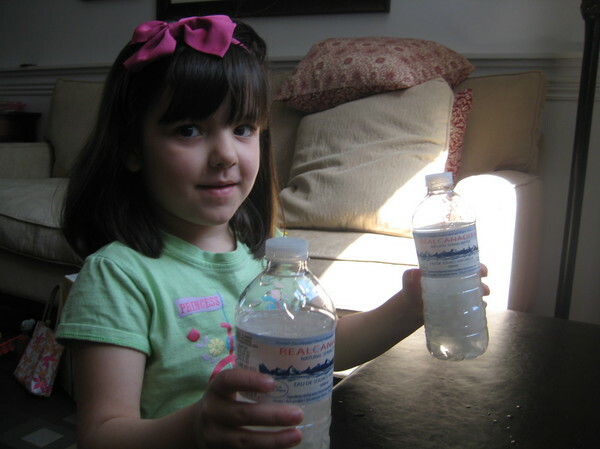 My daughter and I placed five sheets each in two water bottles filled with the same amount of water, shook the bottles five times and noticed the Majesta brand broke down almost instantly. 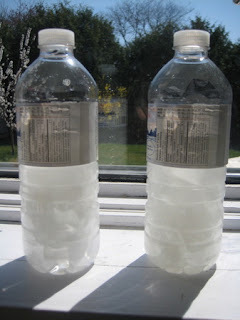 When I drained the bottle containing the other brand of toilet paper, it clogged at the neck of the bottle and, after I poked and prodded, it came out in one large clump.You may notice that the bottle on the left containing the other brand lets more sunshine through compared to the bottle with the Majesta toilet paper on the right that is more cloudy. What would you do with $15,000? Leave a comment sharing your ideas for a "green" makeover and spread some Earth Day love with some inspiring tips on how families can become more eco-conscious. And then be sure to head on over to Majesta's web site and share with them what you've done to be more Treesponsible. Have you planted a tree lately? Disclosure: This post was written as part of the Mom Central Majesta Blog Tour. I received a package of Majesta toilet paper, facial tissue and paper towels for the purpose of this review. I have also received a Chapters gift card as a thank-you for participating. I was not compensated in any other way. The thoughts expressed are my own honest opinions. Hi Diana. Great list of green actions. If I were to win the makeover contest, I'd look at replacing windows and old appliances first. I've been thinking about landscaping as well. Our house is old and one exterior wall in particular gets super cold in the winter. A nice line of cedar or some other large shrubs along that wall would do wonders for heat retention.